HostGator is a name in the web hosting companies that are dominating in the web host marketplace. Offering a lot of hosting tools HostGator is now very popular among the website owners. HostGator is working greatly about the hosting and other projects to give the customers the best of them. They are also selling their plans at a cheap price. This web hosting industry is serving their customers for a long time. The users can easily maintain and get access to all the system and options using this web hosting. I will recommend HostGator for all website owner beyond doubt. What is the purpose of buying a hosting plan? It is very common among the people that they want to create an eye-catching website for any purpose. A blogger, a musician, a businessman, a web designer and others always want to increase their business and fame creating a website. But for making a proper website first thing is you have to select a good web hosting. HostGator comes with an impressive one to make your dream come true. Everyone must be sincere about the function, navigation, cPanel, customization options, and other factors. And for making a website like your with such as how nicely you want your site to be able to scale, how much traffic volume you expect, what are the media content sharing options and others, the most helpful thing is a web hosting. HostGator exactly calculated those problems and wishes of the customers and did their best to add hosting and hosting plans. Everything you are desiring may find in any of their plans. Besides the externals support with customization is more effective. All the required function’s solution is here in one web hosting companies. Looking for a website about the small industry or you want to start WooCommerce business with a high class dedicated server and your budget is lower than the cheap plan of shared hosting? HostGator helps you to take decision offering lots of facilities. So, you don’t have to worry about your budget. Before knowing in broad everyone should know the history behind this successful web hosting company. In October 2002, HostGator was founded by a student of Florida Atlantic University named Brent Oxley. Within 4 years HostGator passes passed the 200000 marks in registered domains. In 2007, the company was moved to Houston, Texas from Florida. In 2012 the company was sold to Endurance International Group but Oxley was the owner of the building that Hostgator used. Hostgator has over 2 million customers and 9 million domains. At present they have their offices around the whole world. It is a great web hosting serving where many websites reside on a single web server. This is one of the cheapest web hosting and popular with a great economical option for the users. 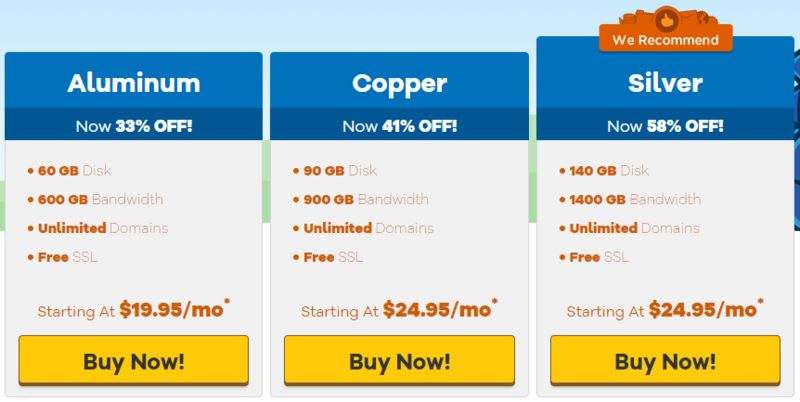 HostGator has 3 plans for this shared hosting. Hatchling plan: This is the cheapest plan of this hosting. Advantages are good in this plan according to budget. One click installation system is provided. You will get a single domain. Unmetered bandwidth is also provided by HostGator. Free SSL certificate is also provided to the users. You can start this plan at $2.75. Baby plan: This plan is the most profitable one that I think. Everything is almost the same as the hatchling plan. Unmetered bandwidth and one-click demo installation system is provided by them. Free SSL is also given. The advantage is you can add unlimited domains on this plan. 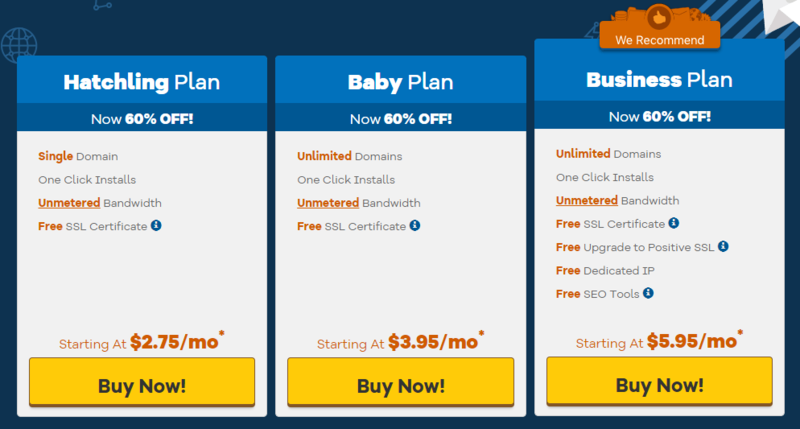 Baby plan requires $3.86 for starting. Business plan: This plan is for the professional people. Lots of advantages are given in this plan. Unlimited domain and unmetered bandwidth is provided. Free SSL certificate and one-click installation system. Extra things are you will get free SEO tools. Free upgrade to positive SSL is also included. Happy to hear that dedicated IP will be given for free. At the starting, you need $5.95, for this plan. Using cloud hosting one can monitor and allocate the external resources with the main server. It is more flexible and flourishes than shared hosting. There are some extra advantages to this hosting. The load time is 2x faster which satisfies the customers. Besides premium software and multiple catching layers are included also there are some other things to make it popular. You will be happy to know that it is 4x more scable and turbocharges your website. There is an institutive dashboard that will help you to understand your site’s performance. They are providing another feature failover that allows you to switch another server quickly if any hardware problem arises. There are also some other features added on this hosting plan that has made the price reasonable. There are 3 cloud hosting plans. Let’s get detail information about them. Hatching cloud: From this cloud plan you will get a single domain. You will also have free SSL certificate. They are providing the RAM of 2GB and 2 core CPU. 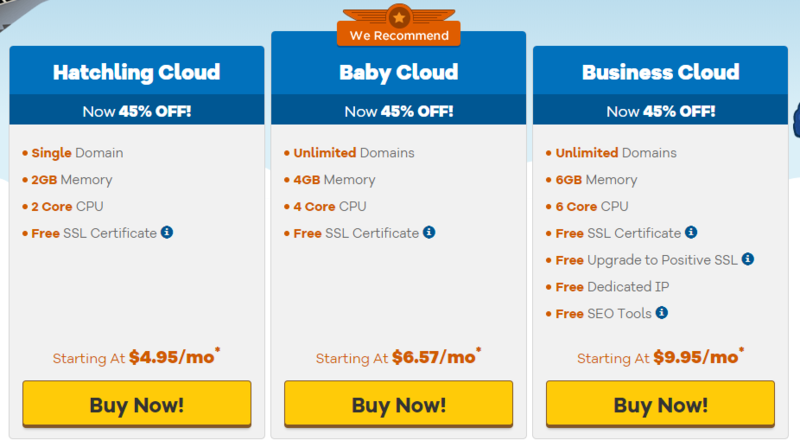 With a low budget, this plan is good for anyone willing to get cloud hosting. $4.95 is the required money for starting the plan. Baby cloud: The baby cloud plan is also an attractive one. They are offering 4 GB of RAM and CPU of 4 core. Happy to know that unlimited domains are also given by them. You will have also free SSL certificate. You can start this plan at $6.57. Business cloud: This cloud plan is a little bit costlier with lots of advantages. They are giving unlimited domains. The customers will get a huge 6 GB of memory and will also get 6 core CPU. You will have free SSL certificate. Free dedicated IP and free SEO tools are also given. Free SSL certificate and free upgrade to positive SSL is also provided by HostGator. This plan costs $9.95 at the starting. WordPress hosting manages all the technical aspect of running WordPress. 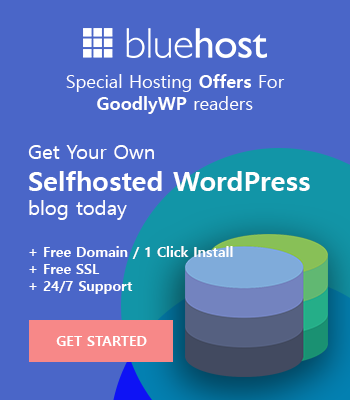 You can notice one thing that WordPress hosting is a little bit expensive. But the extra money goes as the profit if you compare this with its great services and advantages. Let’s discuss them. This hosting is 2.5x faster and the server environment is great. Through a single portal, you can easily manage important files, databases, emails, and others. Another advantageous thing is free migration is available. Another important thing is spyware with advanced security features are provides along with daily scanning for any malware. You will also instant scaling facilities and downtime is less. Cloud architecting helps give this advantage. You will also get automatic backup. Finally, 24/7 customer service is ensured. HostGator have 3 plans for this hosting. Starter plan: You can get this plan with low price. You will have 1 site and highest 100k visitors/month. Also, you will have 1 GB backup. Free SSL certificate is also provided by HostGator. The starting price is $5.95. Standard plan: I recommend this plan to anyone with good advantages. They are providing 2 sites and 200k visitors per month. Backup storage is 2 GB. Free SSL certificate is also included. $7.95 is the starting price of this plan. Business plan: At $9.95 you can start with this plan. 3 sites are provided by HostGator. They are also giving 3 GB backup and 500k visitors per month. Free SSL certificate is also provided. The freelance and web development agencies generally use this hosting. With no incur the costs of server maintenance, software and other, the hosting let you create your own web hosting company. There are 3 plans for Reseller hosting. Silver: Silver gives the highest advantages of this hosting. 140 GB disk storage and that is quite enough. Bandwidth is given of 1400 GB. You will also get unlimited domains and free SSL certificate. Snappy 4000: It is their medium budget plan. CPU of this plan is same like snappy 2000 plan. The RAM is given of 4 GB. You will get 2 TB bandwidth. The disk space is 165 GB here. $39.95 is required as the starting price. 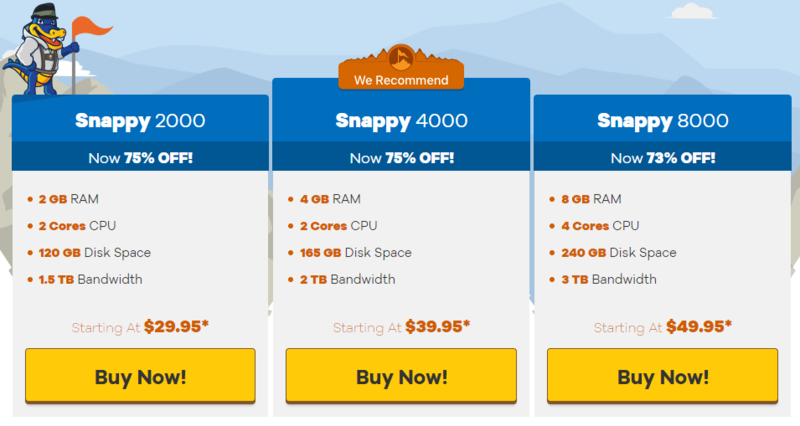 Snappy 8000: This is a high budget plan for pro users. Huge RAM is given and it is 8 GB. Disk space is also 240 GB that can satisfy you. 4 cores CPU and bandwidth of 3 TB certainly raises the price. $49.95 is the starting price of this big plan. Dedicated hosting is a physical server dedicated to your website only. You can’t share bandwidth or disk space with other websites hosted on the same server. So this is faster than shared hosting. The customer visits your site will always appreciate if you use this hosting. There are 3 plans for this hosting. Value server: Intel Xeon-D CPU with 4 core / 8 thread is provided. The memory of 8 GB is also included. Happy to know that you will get HDD of 1 TB and unmetered bandwidth. They are also giving advantage od Linux or Windows OS. The starting price is $119. Enterprise server: Intel Xeon-D CPU with 8 core / 16 thread is provided by HostGator for this plan. No question comes about memory as they are giving 30 GB of RAM. 1 TB SSD is also included in the plan. Linux and Windows OS advantage is also given. Finally, unmetered bandwidth has made it costlier. The first starting price of this rich plan is $149. Actually, windows hosting isn’t so much popular among the buyers. But HostGator gives great advantages like power and flexibility of Parallels Plesk Panel, IIS, award-winning support and easy to use control panel. They have 2 windows hosting plans. Personal plan: You will get a single domain from this plan. Happy to get the news that in this plan there is unmetered bandwidth also unmetered disk space for you. Shared SSL certificate is also included in the plan. You can start the plan at just $4.76. Enterprise plan: This is highly costlier than the personal plan. It costs $14.36 at the starting. You have more advantages certainly. You will get 5 domains from this plan. They are providing free positive SSL and free dedicated IP. Unmetered bandwidth and unmetered disk space are enough to bring a smile of the owner. 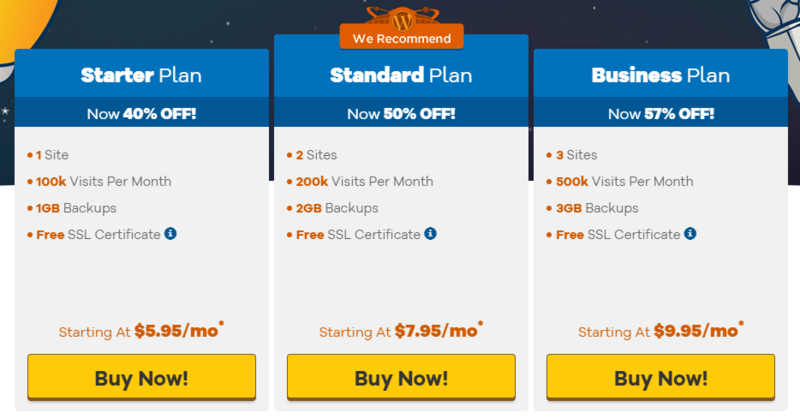 These are the main hosting plans of HostGator. Without these, they have some other options for you like domains, WordPress builder. HostGator WordPress builder is really attractive and you can easily decorate your website with the help of HostGatorwordpress builder. HostGator is really attractive on the fact that they provide high discount rate for their plans. They are providing 73-75% discounts which is really rare rate of discount you can find. Dedicated server plans also under discount and it is 55-56%. This is also a quite big amount for you. Finally, for the reseller plan, they are giving 33-58% discount. So, probably this part of this post is going to make you smile and keeps closer to HostGator. Undoubtedly HostGator is one of the most reliable hosting companies with a high-security commitment. They have different ways to secure all the hostings and plan make sure the safety of customers. I will clear you about this topic. Security for a different data plan: They have used the different certificate for different plans. If you read about the plan you will notice that in hatching plan they are providing shared SSL and in a business plan, they are providing dedicated and private SSL. This is their unique security system and policy. The PIN system: You will be prompted by the account creation system with a unique pin for you. The pin is used only as a numerical number and the length is 4-8 digits. Reliable instructions: Security and protection is a dual activity of both client and hosting services. HostGator is providing their best security besides they are giving enough instructions to their customers. They are providing an instruction list and there you will find some tasks from where you have to keep away and some facts you need to aware of. You will get instructions about the ways you can be safe from hacking. You will get instructions about maintaining a strong password. They also give regular software updates. Enough information about spams and virus will also be found on the list. I am recommending you to use a good anti-virus to keep everything protected. Strong firewall: HostGator has a strong firewall to counters virus and DDoS attacks. From any kinds of threats or attacks, they protect all the networks as they have UPD flooding. When you ask about the question that how they support their customers then I can tell you HostGator is one of the best web hosting companies with the best supporting team. They are proving 24/7 live chat and phone call support. Ticket based email support is also included to give the best support. They have added a support portal on every hosting dashboard. According to customers, they are all satisfied with their supporting team. With any of the customer’s problems, they provide a great support. As soon as possible they solve the problem of the customers. The thing must make you tension free that they have 680+ articles and 500+ video tutorials for the customers. So, undoubtedly no question comes about HostGator support and customer service. Excellent Uptime: You will be very happy to know that Hostgator ensures a uptime of 99.99%. So your website is always up-and-running, stable and consistent. Money back guarantees: Most of the web hosting companies gives you a money back guarantee of 30 days where HostGator is providing the money back guarantee of 45 days before locked with them for one to three years. But there are some conditions for this. Your refund is valid for only shared, reseller, or VPS hosting. Paying the package with a check, money order, or through a bank wire transfer will dismiss the eligibility of refunding. User-friendly, especially for the beginners: The beginners best choice is HostGator. Lots of tutorials and FAQ pages are really helpful for them. Easy to use control panel: The options in the control panel is really easy for everyone. One can easily take control of the site and maintain their hosting functions. Free migration: They are offering free migration service with the new accounts which are signed in for less than 30 days. You can transfer your website from the previous host for free. 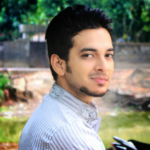 Flexible billing system: You have two options for billing. Monthly and yearly are the two options. Remember the fact yearly billing provides the best discount. About the speed: Overall the speed is okay but I will not say that excellent. Many people have reported increasing the speed of the web hosting. Password cracking: I have already explained the fact that their password providing system is numerical and it is 4-8 digits. Truly this is not a very high protection. It will not be extremely hard to crack your password. But I am saying other protection will keep you safe from a hacker to reach the password. Online chat delay: They have a strong and skilled supporting team but the matter of great sorrow that their online chat support is really slow. Sometimes the customers get disgusted and sometimes it creates miscommunication. Many customers are unsatisfied with his problem. Extra costs for true backup: Many customers have the complaint about the backup system. I recommend you to use the third-party backup system to backup the most important data. Now you have known all the details about this renowned web hosting company. I can tell you overall it is good for you. Their shared hosting service is really appreciated. Their supporting team is also better than other web hosting companies. Most of the people inform them any problem get a proper solution of that. 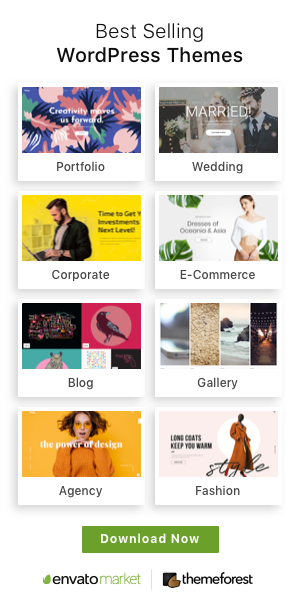 Besides hosting, their WordPress builder is also renowned among the users. A thing you should keep in mind that their hosting types are more in numbers. 7 different types of hostings are provided by them while other companies have 4/5 types. Besides they have created their plan for different kinds of people from different industries. I think anyone can get his desired hosting plan from these hosting plans. That means if you want any complete custom server for your website then they will provide you with a complete dedicated custom server for your website. So, I think you can go with HostGator as you will have a big support and the price is not too high. Please Note This: All of the above pricing table images are taken directly from the HostGator Website. The price can be different in their discount period.